Manager Jurgen Klopp is offering no guarantees to the England international. 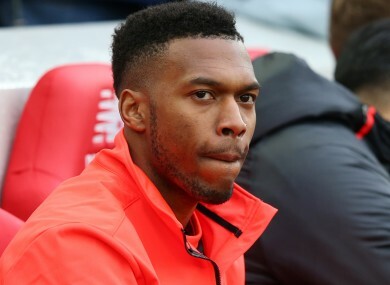 LIVERPOOL MANAGER JURGEN Klopp is unsure over Daniel Sturridge’s future at Anfield, insisting a decision will not be made until the end of the season. Sturridge, 27, has struggled for playing time under Klopp, making just five Premier League starts this campaign. The England international was linked with a move away in January, but stayed at Anfield. He could be set for a switch at the end of the 2016-17 season, though, with Klopp offering no guarantees. “I have no idea what happens in the summer. It is not only Daniel but a lot of players,” said the German. Daniel was not in training for eight or nine days because of a virus infection. We have to bring him back to the best shape possible and then bring this season to an end as successfully as possible. “Then we will make decisions and speak about Daniel and any other players about what will happen at the end of the season. Sturridge, who joined Liverpool from Chelsea in 2013, has six goals in all competitions this season. Klopp’s side are fifth in the Premier League after suffering a 3-1 loss at struggling Leicester City on Monday. Email “'I have no idea' – Klopp unsure over Sturridge's Liverpool future”. Feedback on “'I have no idea' – Klopp unsure over Sturridge's Liverpool future”.